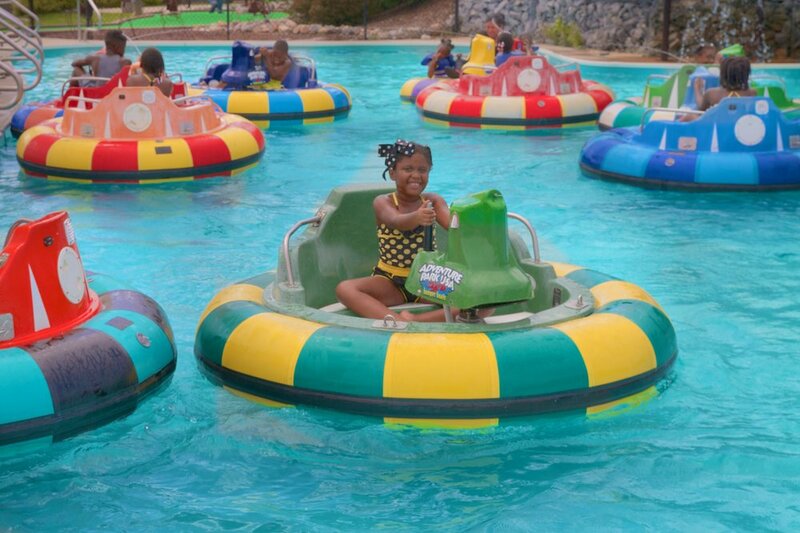 Adventure Park USA is Maryland's largest family entertainment center & Amusement Park. Call us today at 301-865-6800 and start planning a fun-filled trip today! How much does entry to the park cost? Nothing! Admission to Adventure Park USA is free. Simply purchase a Fun Pass for a one-time fee of $1 and add as many credits as you need to enjoy the rides and attractions of your choice. The Fun Pass works like a debit card – except it never expires and you can add more credits at any time! Be sure to check the Specials Page for the best values. How much does each attraction cost? Each attraction costs a different amount of credits. For details about ticket pricing, Fun Passes, and credits, please visit the Pricing section. What is my best buy? Check out our Events and Specials Page frequently for the most recent updates. You can also get information about our specials at the entrance of the park or from the attendant at the Ticket Counter. We use a system of credits on a Fun Pass for all of our attractions and rides. One credit is equal to 10 cents, or 10 credits equal $1. Visit our Pricing section for more information. Can I bring outside food and drink into the park? Sorry, no food or drink is allowed in the park with the exception of birthday cakes with a birthday party reservation. Our Chuck Wagon Café has a delicious variety of food and meals to nourish your whole family. What ages can ride or play an attraction? We abide by certain height, weight, and age restrictions for the safety of our adventurers. These restrictions vary by attraction. Please check our Height and Age Guide for specific restrictions. 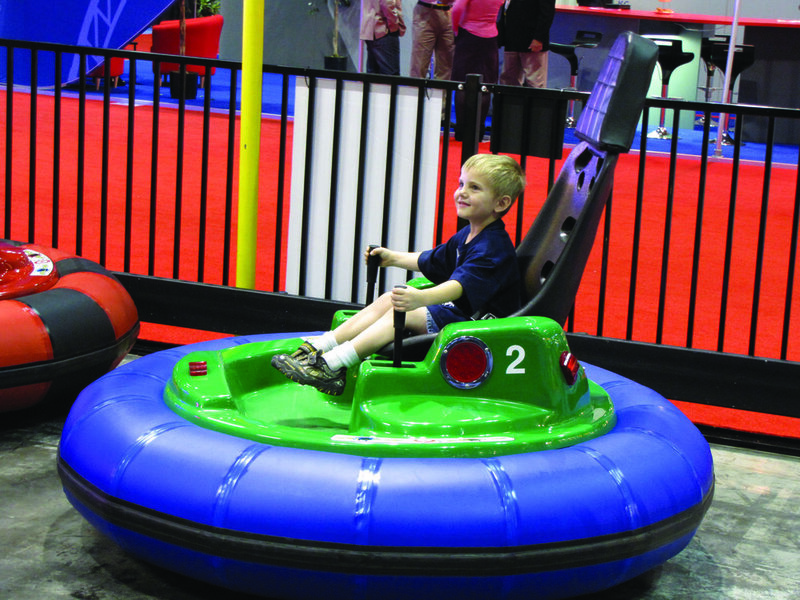 The attractions are the rip-rolling roller coasters, thrilling go karts, mini-golf, bumper boats, laser tag, ropes course, rock wall, bumper cars, arcade games, carousel, tilt-a-whirl, tea cups and many more. Visit our Attractions Page to learn more. You’ll certainly work up an appetite with all the fun you’ll be having here, but you’ll never go hungry during your visit to Adventure Park USA. We have an enormous variety of meals or snacks to choose from, it’s unbelievable! Fill up, cool down, and replenish with something from our tasty menu and get back to your adventure! While enjoying your visit to Adventure Park USA, make sure to discover all that Frederick County has to offer. We are located very close to Baltimore, MD, Washington, DC, Gettysburg, PA, Antietam Battlefields, and Harper’s Ferry, WV. When in the Historic Downtown Frederick City, just miles from Adventure Park USA, why not take a walking tour of the Historic Frederick District and learn all about Frederick’s unique past. For a spookier thrill, experience Frederick’s unique Candlelight Ghost Tours… if you dare! For more family adventure, make sure to check out Frederick’s own minor league baseball team, the Frederick Keys! Experience the action at Harry Grove Stadium in Downtown Frederick, and make sure to bring the kids on firework night! If your visit falls in September, the Great Frederick Fair is a must see. This legendary event features carnival rides, country music stars, numerous animal and plant exhibits, and much more at one of the nation’s oldest agricultural fairs. Why not continue your adventure at one of Frederick County’s gorgeous State Parks? We are located close to Cunningham Falls State Park, Gambrill State Park, Gathland State Park, Greenbrier State Park, C&0 Canal National Historical Park, and Catoctin Mountain Park. These parks feature camping, hiking, picnicking, swimming, nature walks, and the most breathtaking views in the county. Enjoy the beauty of the Blue Ridge Mountains and explore the Appalachian Trail, 40 miles of it run along Frederick’s western border! Every weekend, thousands of antique seekers arrive in Frederick to find the best of the best in antique dealers. Join in on the fun right in Adventure Park USA’s home of New Market, which has been long recognized as the “Antiques Capital of Maryland.” When in Downtown Frederick, you can find over 200 antique dealers in just an 8 block span of the city. Take the adventure home with a unique antique piece for your home! For more information on everything there is to do in exciting Frederick County, make sure to visit the Official Tourism Website at www.visitfrederick.org. For those adventurers that have traveled the extra mile to Adventure Park USA, there are plenty of hotels and even quaint Bed and Breakfasts in the area. Check out the Fairfield Inn & Suites! Click here to receive a special 15% off regular rates for Adventure Park USA guests. Reservations are eligible for Hilton Honors points! This discounted rate is based upon availability. In the instance that the Adventure Park USA discounted rate is not available, Hampton Inn Frederick will provide the traveler with the best available room rate for that time. Please contact Hampton Inn Frederick for 9 or more reservations. In order to make your trip to Adventure Park USA incredibly exciting and worry-free, we’ve prepared some helpful tips to make your planning as easy as possible! Adventure Park USA is a pay as you play facility. Admission is charged at some of our special events that are before or after hours. Rain or shine, you can always enjoy West World Laser Tag, the Stampede Arcade, Hang 'Em High Ropes Course, Rustler's Ridge Rock Wall, Spin Zone Bumper Cars, and our Chuck Wagon Café! Adverse weather conditions such as rain, high winds, or storms may affect the operation of outside attractions. Go Karts, Miniature Golf, Crater Lake Bumper Boats, Carousel, Tea Cups, and the Roller Coasters are all open seasonally weather permitting. Remember, Adventure Park USA is a non-alcoholic, non-smoking family entertainment center! Please respect our rules and help maintain Adventure Park USA’s wholesome and safe family environment. Adventure Park USA is open year round for your enjoyment. For less crowded days during our summer season, try visiting on a Monday or after 2pm on weekdays to enjoy the park. We recommend planning your trip conveniently around your own schedule when all the attractions you want to try are open. Remember, some attractions are only open seasonally. There’s something for children and adults of all ages at Adventure Park USA! Make sure to check our height, weight, and age restrictions for our attractions before you arrive at the park. For the younger children, let them play their hearts out in our extensive Stampede Arcade! Remember, children must be accompanied by an adult. Adventure Park USA accepts most major credit cards for our Fun Pass and Chuck Wagon Café. Feel free to use your Visa, Mastercard or American Express card to load up with all the credits you need! Make sure to dress comfortably and appropriately for a family park. Please wear clothing meant for running around and experiencing all of our attractions. Sneakers should be worn. If you plan to get wet at at Crater Lake Bumper Boats, be sure to wear clothes that dry easily and bring a towel! Please note – No undergarments are to be visible. *Crater Lake Bumper Boats open Memorial Day weekend. Adventure Park USA accepts most major credit cards for our Fun Pass and Chuck Wagon Café. Feel free to use your Visa, Mastercard or American Express card to load up with all the credits you need! Not in the mood for an outdoor adventure? No worries. 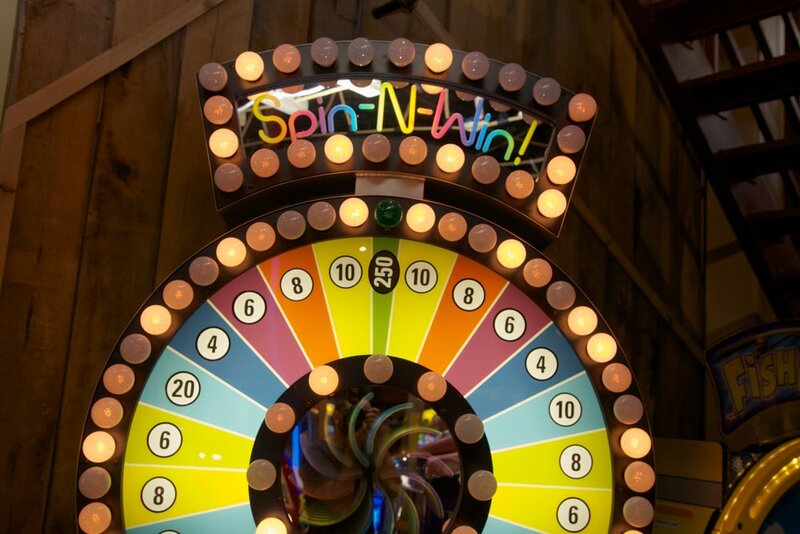 At Adventure Park USA we’ve got over 100 gripping arcade games for you to test your gaming skills! Our Arcade Games are meant for guests of all ages, from the adventure seeking adults to the little tykes. Don’t forget to cash in your winnings for one of our great prizes at the redemption counter! 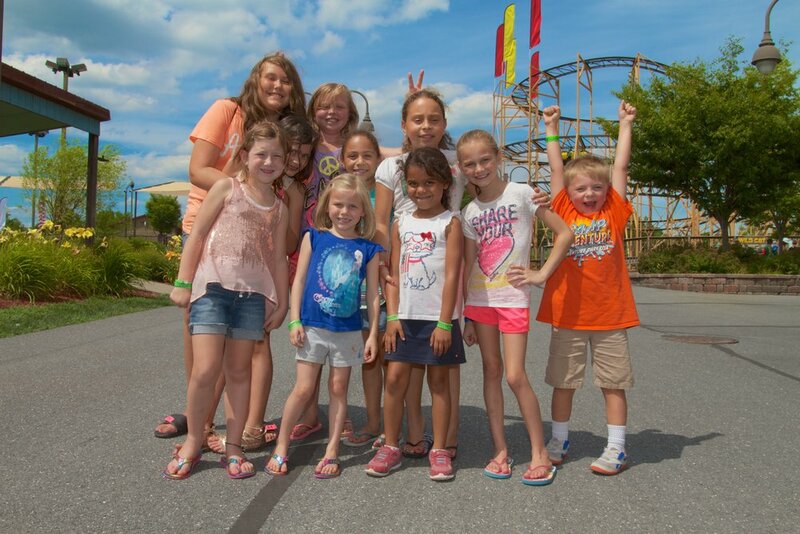 Share the fun of Adventure Park USA with your friends and family and purchase a Gift Card! Our gift cards come in all amounts and they never expire. It’s the perfect way to show you care – they’ll love it. At Adventure Park USA, we do everything we can to make sure all of our guests are accommodated as hospitably as possible. Our park is handicap accessible, as is our Dry Gulch miniature golf course. If you have any questions about visiting the park, please contact us so we can assist you the best we can. If you left something at Adventure Park USA, we have a lost and found behind the front counter. We will gladly keep your items for 2 weeks, and then we donate them to the Salvation Army. While we don’t allow any outside food or drink in Adventure Park USA, you can fill up with a satisfying meal or snack anytime at our Chuck Wagon Café. We have tons of options to choose from! Make it a meal with our delicious, one-of-a-kind pizza, chicken nuggets and hot dogs, french fries and funnel cakes or cool down with our fun to eat Dippin’ Dots or Icee’s. Adventure Park USA adheres to a non-smoking and non-alcoholic policy in order to respect the values and differences of our clients. We recommend wearing sunscreen and packing extra, even on cloudy days. Wearing a hat and light-colored clothing will also help protect you from dangerous sun rays. Remember to drink plenty of fluids on hot days, and come inside to our air conditioned attractions if the heat gets unbearable! Do I have to have a reservation to have a party at Adventure Park USA and can I make a reservation on the web? Yes, you must have a reservation to have a party at the park. No parties in the park may be set up without a reservation. You can make your reservation by phone or by clicking here. Please call us at 301-865-6800 to book by phone. Registered birthday parties may decorate the party room. We do not allow piñatas. If the number of guests increases by more than 2, we ask you to notify us in advance. You will only pay for the number of guests that come to the party, however, there is a minimum of 8 for the Classic party. There is a minimum of 10 for the Ultimate Party. What if I want the room for more than one hour? The party package includes time in the party room for one hour; additional hours add to the cost of the party and must be added at the time you make your reservation. If I don’t have 8 party guests can I still have a party package? Yes, however, the minimum number that you will pay for is 8. The only exclusion is the Ultimate Package; that has a minimum of 10. The average party takes approximately 2 hours. The first hour is spent in the party room and the remaining time is spent at your chosen attractions and in the Stampede Arcade. The Ultimate party includes 3 hours of access to rides and attractions in addition to the hour in the party room (Limit 2 Go Kart rides when available). With a birthday party reservation, you may order a cake from Adventure Park. We have 1/4 sheet cakes and 1/2 sheet cakes, as well as 10″ round or 1/4 sheet ice cream cakes that are made especially for Adventure Park. The cake must be ordered at least one week in advance. You can order a white or chocolate cake; all cakes have white icing. Use the button below to submit an online application for employment with Adventure Park USA! Thank you! We have received your application and will contact you if there is a position available.